PMC ammunition is great for target practice and range training. It is both precision manufactured and economical serving as a great alternative to the steel cased products that are available. Each round contains a boat-tail bullet for improved long-range accuracy seated in a boxer-rimed, reloadable brass casing. For shooters and hunters who appreciate affordable quality ammunition, the PMC Bronze Line offers reliable performance for every shooting application, from target shooting to hunting. This long-popular ammunition line makes it possible for hunters and riflemen to enjoy high volume shooting without emptying their wallets. 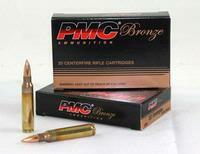 Bronze ammunition is available in Full Metal Jacket (FMJ) bullet types. I used about 350 rounds in one day. No malfunction, no bad ammo, good price. Excellent practice ammo.